Before setting yourself an exercise program, you need to address all the reasons that will stop you from doing it! It’s all a matter of priorities really… If something is important enough to you, you will make time for it. Find a friend to do it with you or exercise at home. Many people start out and do too much in too little time. Find exercise that suits you – and begin with something gentle (i.e. walking). Walking is something that can be done anywhere, as is home exercise DVDs. Over time physical activity will become easier. 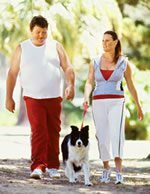 Some exercises are more suited to larger bodies than others (such as swimming, walking, treadmills, and elliptical trainers). If possible, make a plan of exercise goals, a basic timetable of when, where, and how, you will stick to it. Start with whatever you can achieve. Aim for 20 minutes of walking. If you can’t achieve this, then stop when you can. Your goal is to walk 20 minutes a day for 5 days a week. This works! Research shows that even a 30 minute walk can be as effective as something longer. Make sure you have good shoes! This can make all the difference. If you are not used to exercising, your joints and muscles will take a short while to get used to it. Expect to have a few aches or pains the first week (note that anything more significant – you should consult your doctor). There are many smartphone apps that will track your walk or your step count. Aim for a weekly increase of 500-1000 steps. Research shows that this kind of exercise is critical for maintaining weight loss. Have you ever thought of getting a dog? They’ll make sure you never miss a daily walk again. Don’t quit! Make it a part of your lifestyle. This can be a low-impact exercise that has minimal impact upon your joints. Swimming strengthens the upper body as well as involving the lower body. Very popular form of exercise, but not particularly well suited to you if you are a larger person. Jogging and running place significant stresses on bones and joints. However, it is one way to fit more exercise in a shorter space of time! Stretching is essential. One of the most popular methods of exercise today is by using fitness equipment. Treadmills, rowing machines, elliptical trainers, and stationary bicycles are just some of the options available. Most of this equipment is available in you local gym or fitness center. However, for many of us, going to these places can be disconcerting. Purchasing your own equipment is an option.